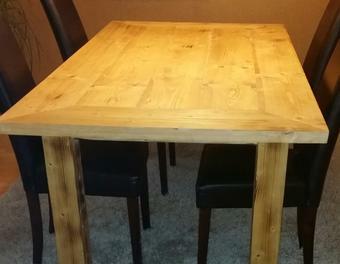 Here is a dining table 2m x 1m. The top is in Baudielen. 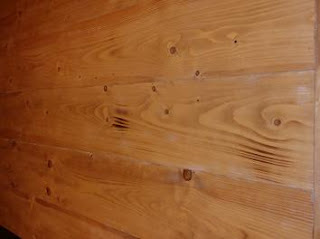 The Finish would be achieved with a roofing torch. 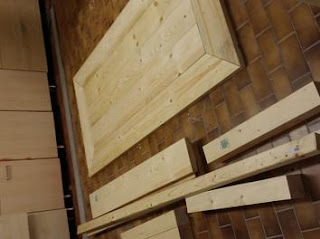 First I have the boards to the desired length and the outer cut to 45 ° miter. 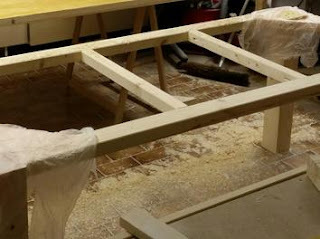 Then, the elements were glued to mounting wood glue. Now we had to wait 48 hrs. Until the glue is dry and full loading. Then it was grind grind grind. For this I have the bars cut to length and then screwed together and glued. To get even more stability, the blends were screwed by the miter, in the corners of the substructure. So I did not need any angle. To obtain a natural but more rustic touch, everything was flamed with a roofing torch and connect with worktops oil treated.